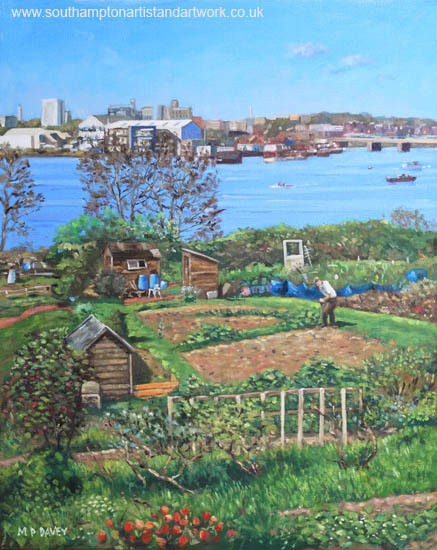 This painting shows an area of allotments in Southampton, beside the River Itchen. The allotments are on the Bitterne side of the River. On the other side of the river can be seen a part of the east side of the City of Southampton, stretching from the civic centre on the left to the Northam bridge on the right with boat yards and facilities on the river bank, and larger buildings found in the City centre on the horizon. The allotment is on a steep hill, going down to the river and is quite large in area and in the amount of plots with little sheds located there. The painting was done on a canvas board measuring 20” x 16” and done using oil paint on an acrylic base.